Morthal is a town shrouded in mystery. 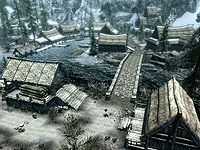 Its people are reclusive and wary of newcomers, and only a lumber camp, an apothecary, and an inn support its weak economy. 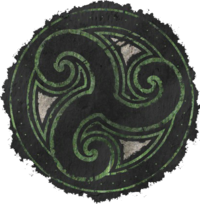 The Jarl is somewhat reclusive and this and her mysticism has fed into a general perception that she is a do-nothing ruler, and Hjaalmarch is one of the poorest of the nine Holds. The Hold is still part of the Empire, but the Jarl Idgrod Ravencrone cares little for the conflict, claiming to sense bigger things afoot in the world, and only supports the Empire as far as she deems their aims to accord with the good of Hjaalmarch. A number of the people in the town are concerned about the prospect of war. War brings outsiders, and outsiders are not a welcome sight in Morthal. Most would rather the conflict were kept outside their home, leaving them free to continue to live their lives in blissful isolation. The swampy lands immediately surrounding Morthal are rich in deathbells, swamp fungal pods, and giant lichen. Leveled creatures (trolls and a rare occurrence of chaurus in open space) are spawned there during nighttime. Just outside of town to the southeast, a Nordic barrow can be found, guarded by a leveled skeleton. Inside, a copy of the Illusion skill book The Black Arts On Trial rests atop a shelf. To the left, the body of a novice conjurer with a dagger in his chest can be found in front of an open tomb, next to a table with a Scroll of Turn Lesser Undead on top of it, and a Staff of Revenants. With Hearthfire, you can purchase a plot of land in Hjaalmarch to build a house on. This page was last modified on 22 October 2018, at 20:24.